The principle behind CEDM is similar to that of breast magnetic resonance imaging as they both assess tumour neoangiogenesis; therefore, with some exceptions, most of the indications for breast MRI apply to CEDM. 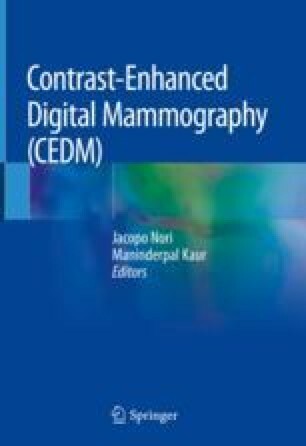 CEDM is increasingly being adopted in breast-imaging centres, largely due to early clinical studies demonstrating this technology’s ability to provide both anatomic and functional information of breast parenchyma similar to MRI but at a lower cost and shorter duration of examination. Because such capability can be an added feature to the newer generation mammogram machines, we expect that the use of CEDM will increase. However, there is limited guidance regarding how to best implement this technology, and there are no standard guidelines for the clinical use of CEDM. In this chapter, we discuss the implementation of CEDM into the clinical practice setting, with a review of the available literature and perspectives from our large tertiary academic hospital.